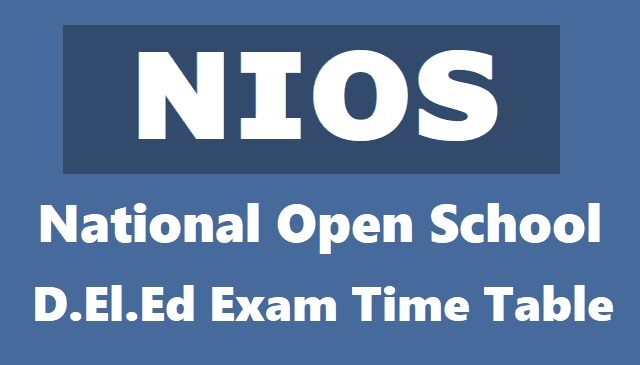 NIOS National Open School D.El.Ed Exams Time Table 2019 (D.Ed Exams Date Sheet): National Institute of Open Schooling, NIOS is going to conduct the Diploma in Elementary Education D.El.Ed. examinations. The institute has released the date sheet of exams. The exams would be conducted as per its time schedule. The dates and timing of the exam are provided below. The candidates are also informed that the exams will be conducted from 2:30 pm to 5: 30 pm. The candidates who have registered for the exam check the dates and timings of the examination. D.El.Ed. is designed for all untrained government, government aided, private unaided recognized in- service untrained teachers of Elementary Schools. NIOS D.El.Ed Exams time table 2019 /NIOS D.El.Ed date sheet 2019: The National Institute of Open Schooling (NIOS) has released the date sheet for the D.El.Ed (Diploma in Elementary Education) fourth examination. The examination will be held between February 14 to 15 in afternoon shift from 2.30 PM to 5.30 PM. The D.El.Ed examinations will be conducted for three subjects, Learning in Art, Health, Physical and Work Education at Elementary Level, Learning Social Science at Upper Primary Level, and Learning Science at Upper Primary Level. NIOS D.El.Ed exams: February 14 and 15. Candidates would be required to carry the identity card sent by the NIOS and the print out of the hall ticket in the examination hall along with a valid photo identity proof issued by the government. In case a candidate is not carrying the necessary documents they might not be allowed to appear for the exam, according to the official release. The diploma in elementary education is an exam held by the government of India for untrained teachers teaching the primary and upper primary classes. The teachers to appear for the programme to attain the at enabling skills, competencies, attitudes and understanding required to make them more effective. The result of examinations is expected to be released in 8 to 10 weeks after the last date of examination. 3rd NIOS D.El.Ed exams 2018 in December 2018: NIOS 3rd D.El.Ed exam dates & shift details released: The National Institute of Open Schooling (NIOS) has released the time table for 3rd D.El.Ed examination which is scheduled to be held in the month of December 2018. As per the information released by NIOS, the 3rd D.El.Ed examination will be conducted on December 20 and 21. NIOS D.El.Ed exams: December 20 and 21. The examination will be held for 'Understanding Children in Inclusive Context (506)' and 'Community and Elementary Education (507)' subjects in the afternoon session (from 2.00 PM to 5.00 PM). 2nd NIOS D.El.Ed exams 2018 in November 2018: Meanwhile, the exam fee submission deadline has been extended by the NIOS. Earlier, the last date to submit the exam fee was October 15, but it was extended to October 25. The exam fee date has been further extended till October 30, 2018. NIOS has also released the exam schedules for 2nd D.El.Ed subjects. The exam will begin on November 15, 2018 and will continue till November 30, 2018. The examination for NIOS vocational courses will begin on November 15 and will continue till November 29, 2018. NIOS D.El.Ed exams: November 15 to 29. NIOS D.El.E.D 2018 Exam time table for September exam: NIOS National Open School D.El.Ed Exam Time Table 2018: National Institute of Open Schooling, NIOS is going to conduct the Diploma in Elementary Education D.El.Ed. examinations. The institute has released the date sheet of exams. The exams would be conducted from September 25th to 29, 2018. The dates and timing of the exam are provided below. The candidates are also informed that the exams will be conducted from 2:30 pm to 5: 30 pm. The candidates who have registered for the exam check the dates and timings of the examination. D.El.Ed. is designed for all untrained government, government aided, private unaided recognized in- service untrained teachers of Elementary Schools. The National Institute of Open School released the date of it's D.El.E.D programme. Given below is the date sheet and other important details. The National Institute of open schooling (NIOS) has released the date sheet of 2nd Public Diploma in Elementary Education (D.EI.ED) programme. The exam will be conducted on 25th September, 2018 in afternoon session, from 2:30 pm to 5:30 pm. As tweeted by NIOS a total of five exams would be held. There are no holidays given after each exam. The exams would be conducted for un-trained teachers of primary or upper primary schools across India. The first exam would be held on 25th Septmeber, 2018 with Elementery education in India as it's first test and Learning Environmental studies at primary level, being the last. Given below is the date sheet for 2nd D.EI.ED exam.The registration for the 2nd D.El.E.D programme was closed in July, 2018. The applicants, who failed to register for the first examination held in the month of May, 2018 were allowed to apply for the examination for the subject code- 501, 502, 503 with addition to the registration fees for 2nd D.EI.E.D.NIOS has also extended the last date for submitting the applications for admission to Vocational courses. The Diploma in Elementary Education programme is conducted for the training process of un-trained in-service teachers working in primary or upper primary schools of different states of the country. The programme has been designed by the Academic department, NIOS on the initiative of Ministry of Human resource Development, Government of India. The programme has been developed to make teaching and learning better and effective. National Institute of Open Schooling, NIOS has released the date sheet of Diploma in Elementary Education D.El.Ed. first semester examinations. The candidates who have registered for the exam check the dates and timings of the examination. The D.El.Ed. is a two-year diploma in elementary education for in-service untrained teachers. The minimum time for the course is 2 years and the maximum time period of the course is 6 years. The teachers should have at least 2 years of teaching experience at the time of admission. The programme is developed by the Academic Department, NIOS on the initiative of Ministry of Human Resource Development, MHRD. Diploma in Elementary Education, D.El.Ed programme is a designed package for in-service untrained teachers working in primary/ upper primary schools of different states of the country.